Mary Pflum Peterson is an Emmy Award winning producer for Good Morning America. She is a driven, highly successful television professional and former reporter for CNN. Her childhood, however, was complicated. Her mother suffered an emotional breakdown and took solace in hoarding, filling the house with “treasures.” The bond that held mother and daughter was symbolized by the white dresses that marked important milestones in their lives. 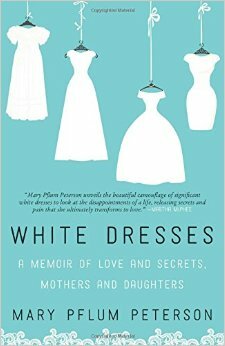 She tells her powerful and important story in White Dresses: A Memoir of Love and Secrets, Mothers and Daughters. Thursday, November 12th at 8 pm on WETS, 89.5. Sunday, November 15th at 8:30 am on WPVM, 103.7. Sunday, November 15th at noon on WEHC, 90.7. Sunday, November 15th at 2 pm on WETS, 89.5. Monday, November 16th at 1 pm on WEHC, 90.7. Wednesday, November 17th at 6:30 pm on WEHC, 90.7. Via podcast 11 am Pacific, Sunday November 15th.